Last weekend we got away to the coast and I got started on my spring cleaning. 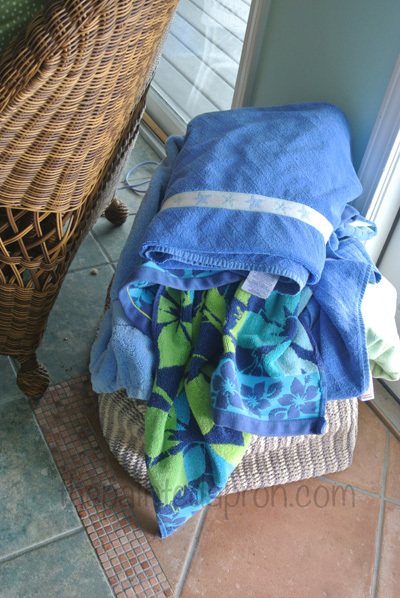 This basket of towels lives by the doors that lead out to the porch, pool and beach. Do you have something in your house that needs replacing or fixing but you just walk by daily and not even notice? Look what I found at Home Goods a few weeks ago! 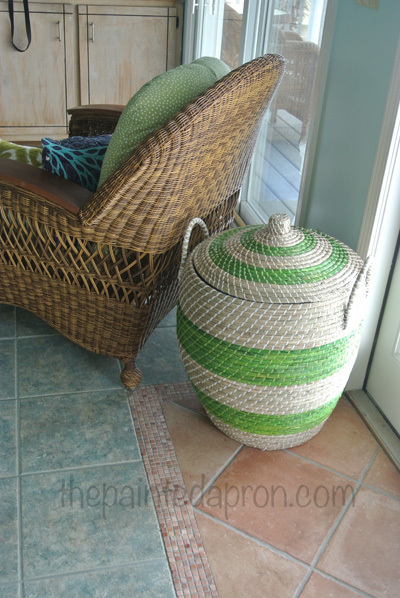 Great price too, baskets can be so expensive and I thought $60 was a steal for this big beauty. I was just cruising around and there is was…all alone…I couldn’t believe my luck, it was so PERFECT! I glanced all around feeling like a thief in the night… before I grabbed it and plopped it in my cart…I couldn’t believe this was going home with ME! Just in time too, on my way to the check out people were ohhhhing and ahhhing, clearly wishing they had spied it first! Lucky me! Residences line one side of Ole River, in all colors, shapes, and sizes. 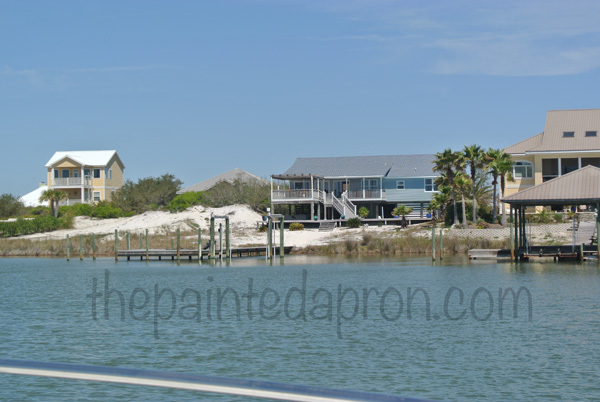 The houses are on a private, gated island, called Ono Island. There are lots of theories about where Ono got its name. The most popular version is that because the island is half in Alabama and half in Florida that both states were fighting over the property rights…It’s in Florida, Oh no, it’s in Alabama…silly, I know…but that’s the local legend! Alabama eventually won the battle so the whole island is considered in Alabama, and everyone has an Alabama address, even though the island straddles the state line. 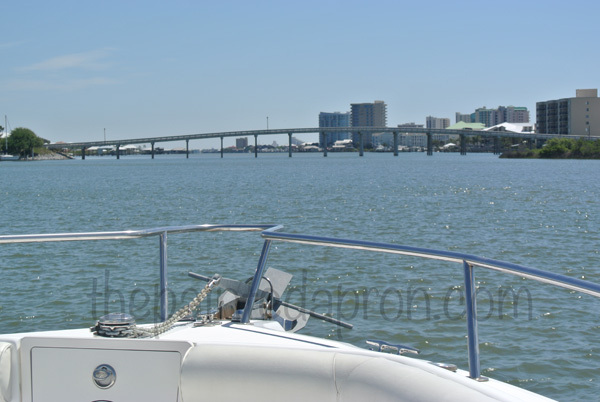 It’s still a little chilly on the water so instead of going out into the Gulf we turned around and decided to just cruise down Ole River. The bridge up ahead is the bridge from the main beach road onto Ono island. 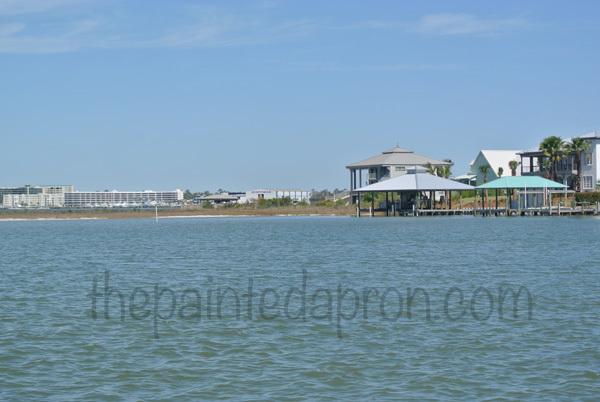 The main beach road which is actually on another island, or thin strip of land called a “key.” This key is also partially in both states and connects to Orange Beach Alabama and Pensacola Florida by a bridge at each end. 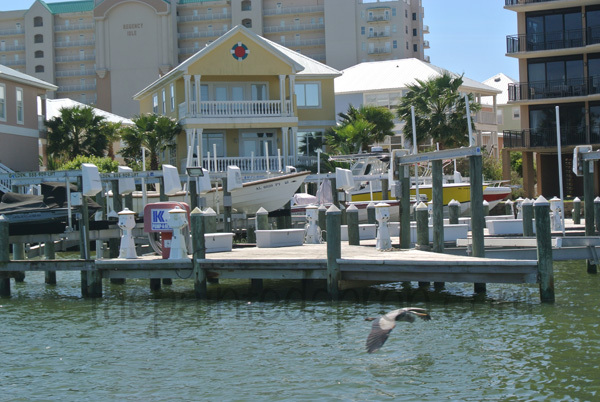 Perdido Key is considered a barrier island, only 1/4 of a mile wide in most spots. It is the only thing separating us from the Gulf of Mexico. 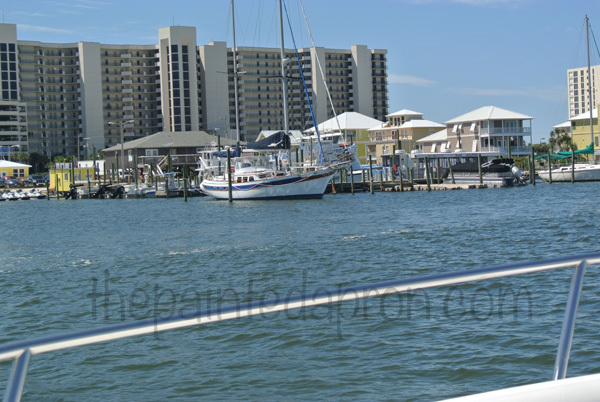 Perdido means “lost” in Spanish and the area was a haven for Spanish pirates hundreds of years ago. 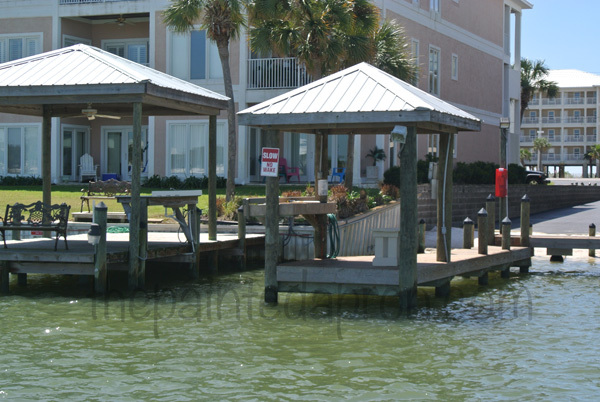 On the Perdido Key side of Ole River there are lots of condos, houses, boat docks and small businesses. all live happily together in this maze of piers. 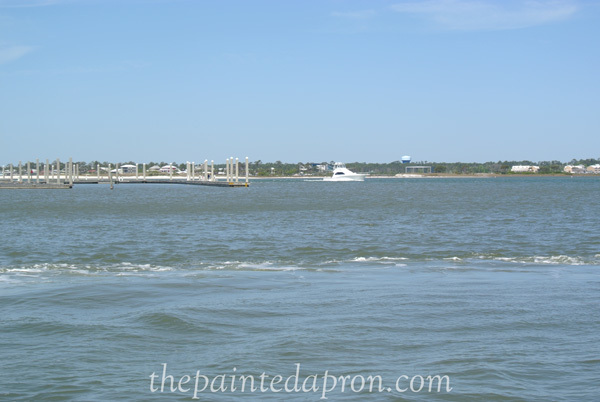 This is the water view of state line between Alabama and Florida. 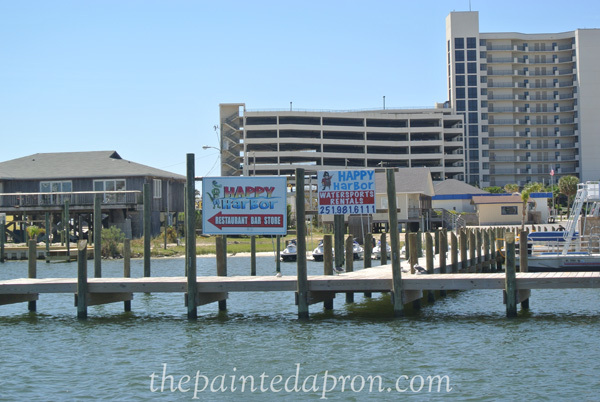 The line is marked with a world famous bar, the Flora Bama which is the low building in the center of the photo. 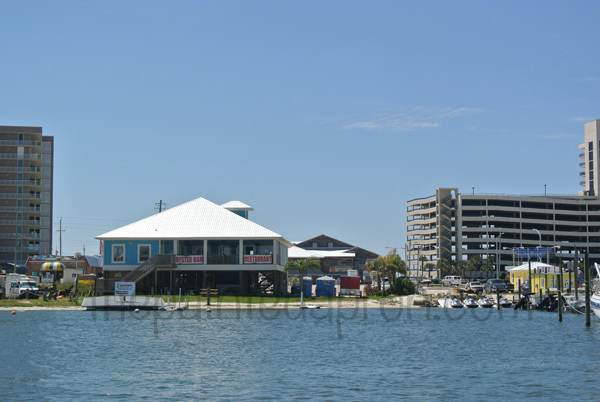 The Flora Bama is located on the beach side of the key and you can walk out to the beach from the rear of the bar. 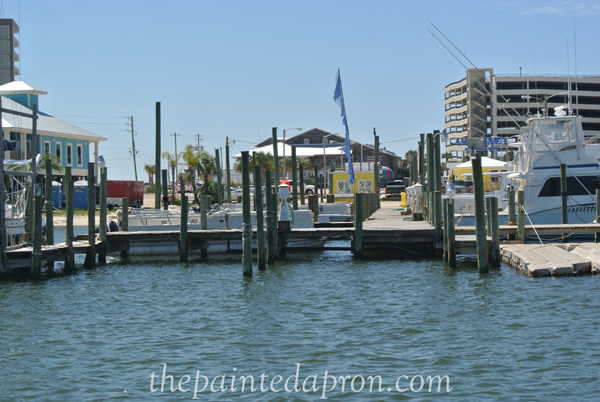 Lots of boaters dock their boats and walk across the road to the Flora Bama which is in the center of the photo just beyond the blue flag. The last weekend of April is their annual “Mullet Toss” where people flock from miles around to actually TOSS A DEAD FISH to see who can throw it the farthest. Really! You can’t make this stuff up! Oh look there are some dolphin! Look closely into the center of the photo and you will see their gray backs and fins. 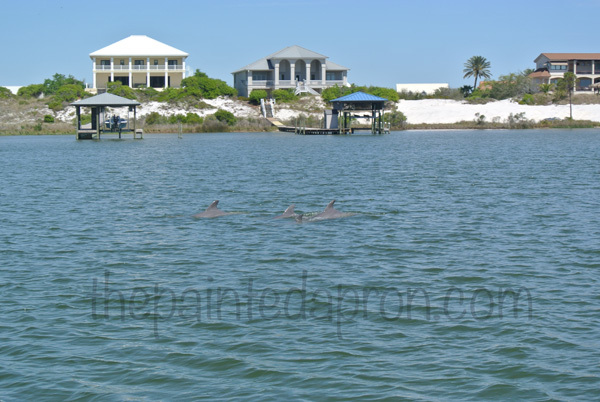 We see dolphin daily from our porch. 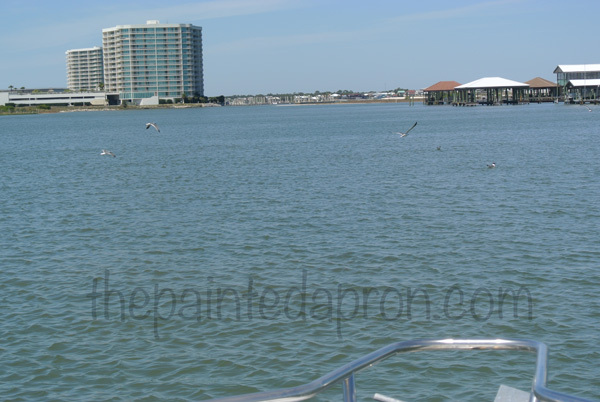 After the BP oil spill in the summer of 2010 all the wild life disappeared. 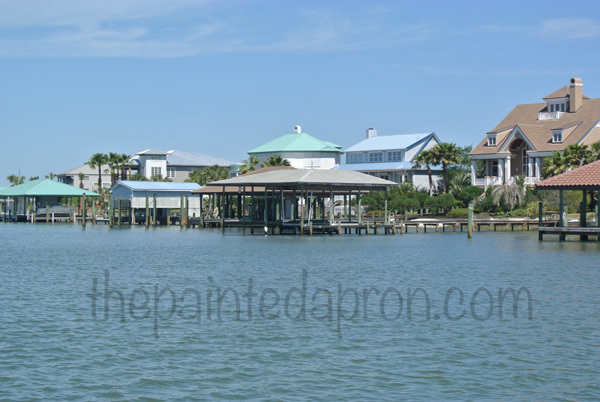 The waterways were blocked off and we spent the summer sitting on the porch watching the clean up going on in the Gulf of Mexico. It was a terrible scary time. But by the next summer, the wild life was back and the day we saw the first dolphin again, we knew that nature was bouncing back. Summer is just beginning, and there’s lots more to see in the next few months! 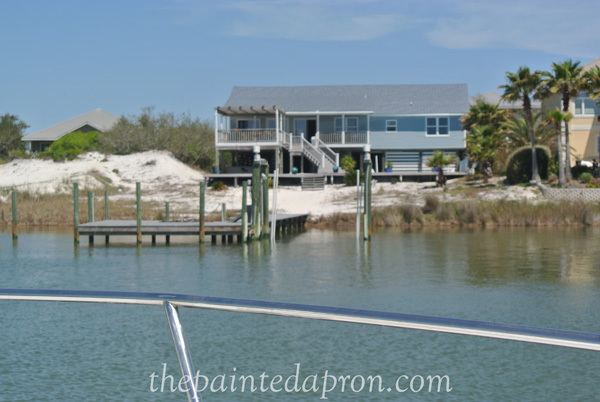 Be sure to stop back by for some interior tours and beach time recipes! You need to come back and visit soon, not too far from you! Happy gardening! I know! What a coincidence! I had no idea, until this morning, that you were even in same country, much less the same southern ground! Happy boating! What a fun boat ride to take us on Jenna! And I LOVE your new basket!! 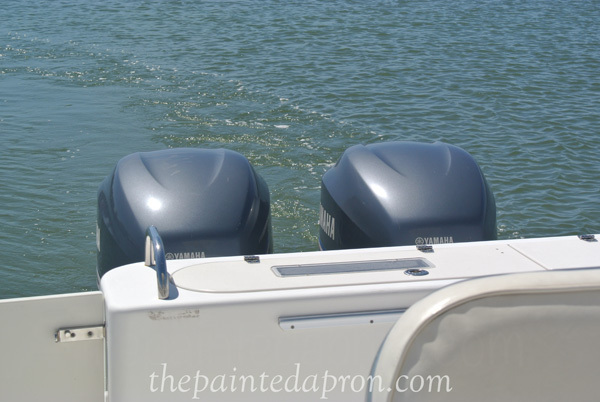 Seeing your photos makes me very anxious to get on the water, however, I will have to wait until Memorial Day when we return to Maine and get our boat in the water. I looked at those baskets the other day. I was tempted but came home without one. Thanks Lulu, that is so funny that you saw the basket too! I have banished myself from HG for a while, all too tempting! 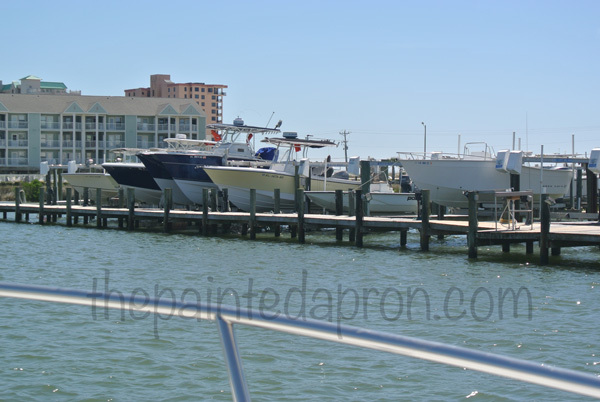 Memorial Day will be here before we know it and you will be back on the water! No kidding, boating is brutal on hair! I usually clip mine up in a bun and put on a hat! I enjoyed this beautiful post, so much! 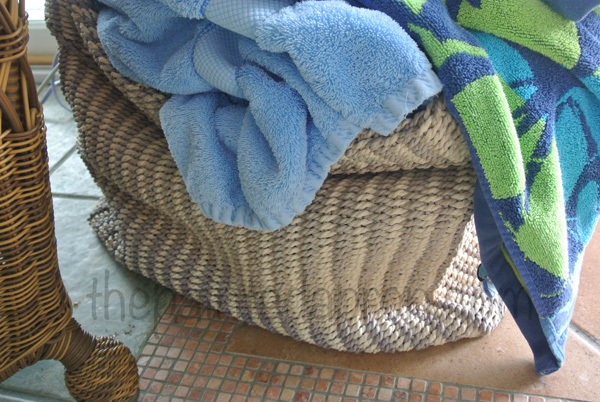 Love the new towel basket. We are going to try to get to the lake for Spring cleaning sometime over the weekend…weather depending. We are going to be listing our place. It will be bittersweet, but much needed. Thanks Pat, I still have Spring cleaning to do in B’ham and on the coast, I never seem to catch up! It is difficult having 2 places, lots of work and HH & I are getting older and lazier! 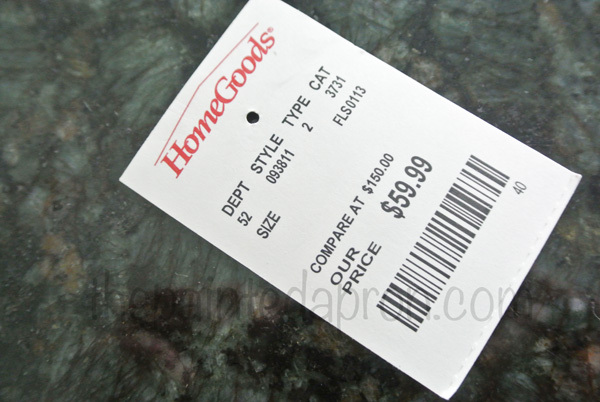 Good luck with your sale, I know it will be hard but you might have a great sense of relief! 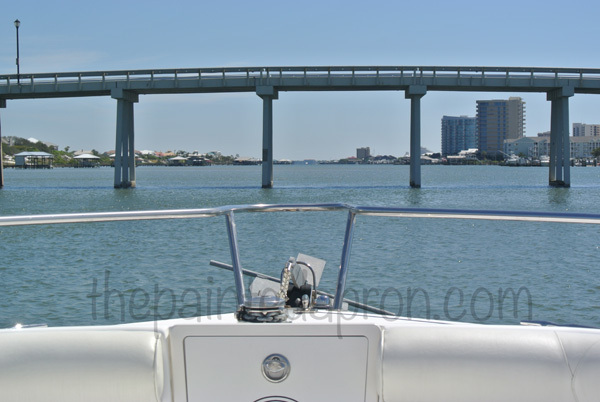 It sure IS a boater’s paradise! And all the sea life you can see!!! Dolphins, for cryin’ out loud!!!!!! Summer is just around the corner (at least for most of the world…it’s snowing here!). Enjoy yourself! Now, that is TOO FUNNY!! My niece always says she lives in Kansas City, but her address is Fairway KS, and it is very confusing!! Yes, we are very lucky, and we appreciate it every single second…I can’t believe you are having snow!!! It is 81 here today! Pollen is still knee deep! Oh how we Georgia/Alabama folks love the Gulf coast! 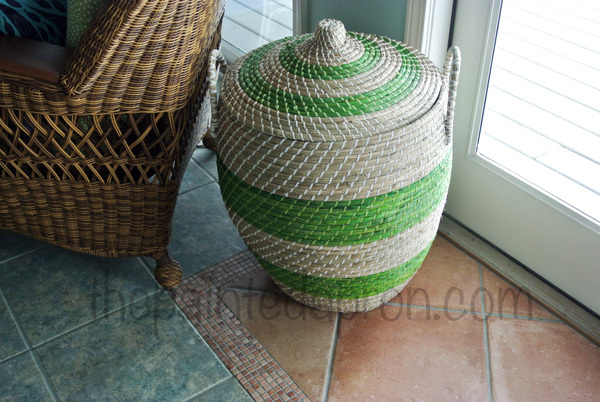 Your place looks wonderful and that basket was a great find! 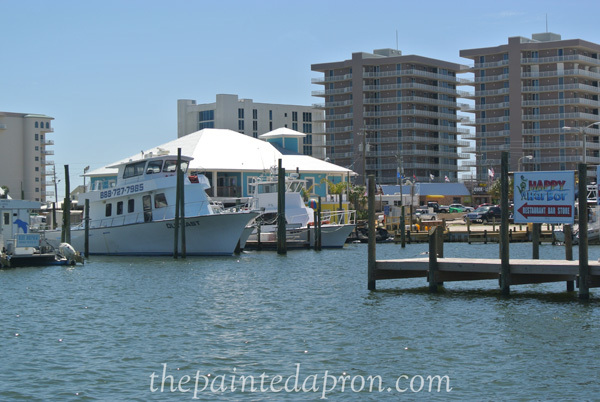 I have never been to Ono, but all my life have vacationed on the Gulf, either in Pensacola or Panama City. 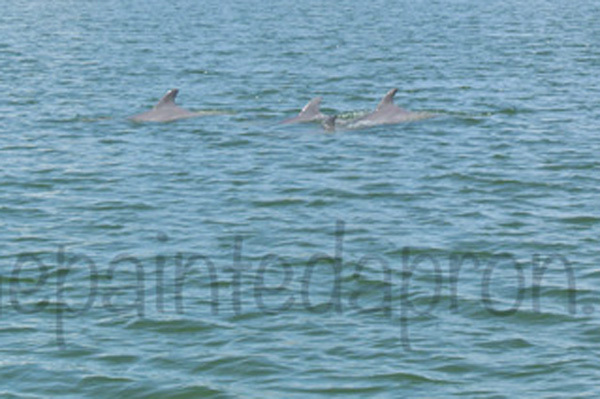 We watch the dolphins, as well – what a show! 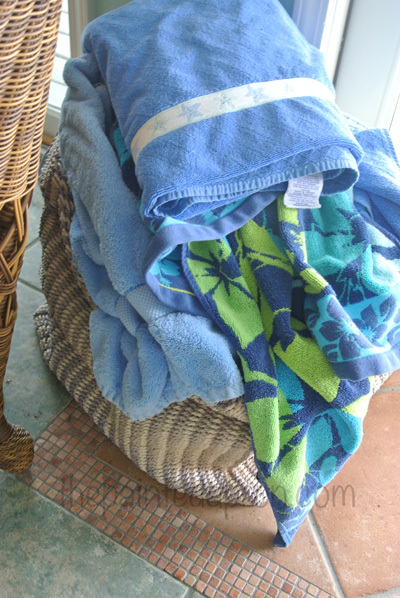 Thanks for sharing – I am going back next week – time to do some cleaning and get some sand between by toes!! 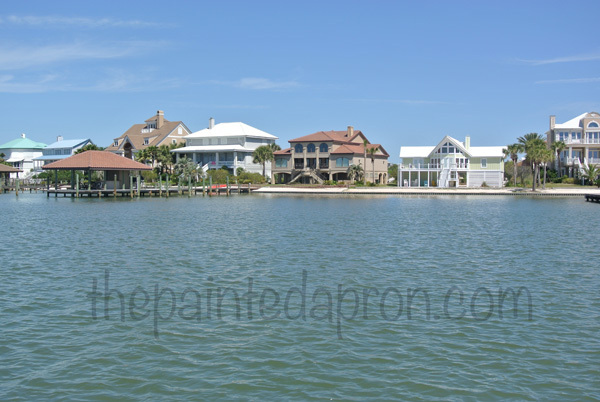 Oh to see dolphins swimming from your porch, we see ducks, not nearly as exciting 🙂 I’m always ready for a boat ride, it’s that time of year for us too if we survive pollen season! 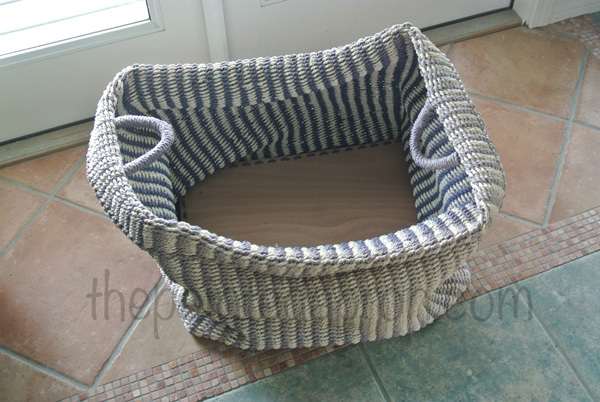 Love your new basket to house your towels! So lovely. I love the setting for a meal. I don’t know how you can tear yourself away to do any cleaning…LOL! Trust me, not much work gets done around there! Thanks for visiting! Oh.. this is just mean! KIDDING! You see, that gorgeous warm sun that is beating down in your photos has failed to show up here in Chicago. I actually took a picture of snow coming down this morning! What????? Anyway, all kidding aside I loved reading your post! It tickled me to read how the area got its name. Funny how things come about. Thanks for the boat ride.. I had a lovely time! Oh dear, I can’t believe it’s still snowing! I was a little hesitant when I posted this, I was afraid it would be frustrating to those still waiting for Spring! Yucky weather here too – we are still waiting for spring. I lost both of my potted hydrangeas this week – not on the nights it snowed but on a windy night – the arctic blasts burned them – so sad. What a dream place you have! 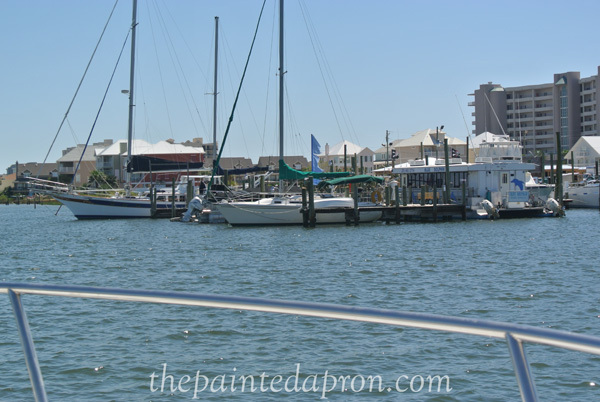 How wonderful to be there where you can hop right in your boat and just take off to tour such a lovely shoreline or head to the Gulf. 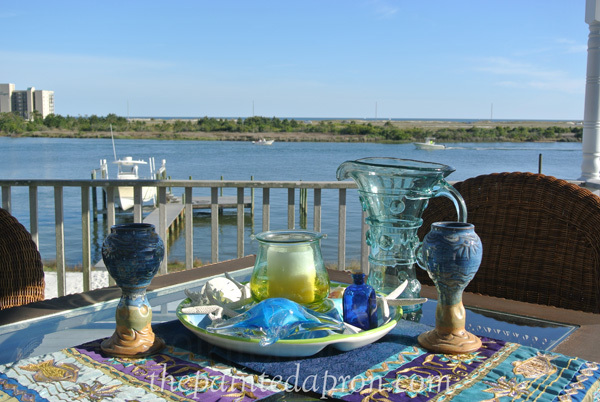 Your table is fabulous too – it just gets me aching for summer. I loved your boat ride, thank you for taking us along. You know how much I love your pictures! I will feature this post on Thursday’s post. Thank you for sharing.